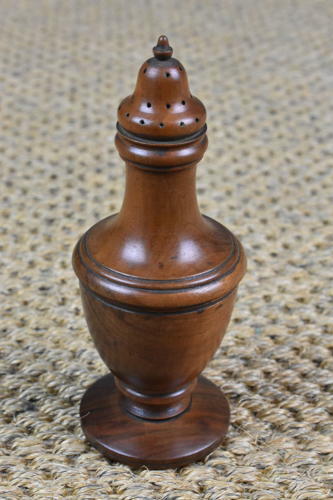 An early 19th century muffineer or pepper of attractive baluster form turned from sycamore wood of lovely, nut brown colour. The pierced top of the muffineer, complete with decorative finial, unscrews for the spice or pepper to be inserted. Such pieces were often used to sprinkle cinnamon on to hot buttered muffins hence the name. A pleasing example remaining in excellent, original condition. Circa 1800-20. Similar examples can be see in 'Treen for the Table' by Jonathan Levi.